The annual fall striped bass migration is dense with fish but seems stalled between Collinsville and Decker Island, where the bulk has held up. Bass weigh 3 to 9 pounds, with the rare exception tipping the scales into the teens. Best way to catch is to troll and use a deep-diving lure with a white plastic worm trailing, in 12 to 16 feet of water. Said expert troller Mark Wilson of Sacramento: "Fishing the deeper water and moving from spot to spot to avoid the wind and floating vegetation, will eventually lead to stripers. Once I get a bite, I work the school until it moves." Some prefer to toss artificial lures, such as a Rat-L Trap to cover plenty of water and create reaction strikes. A two-day, catch-and-release striped bass derby, with only Rat-L Trap lures permitted, runs Saturday and Sunday out of Lauritzen Yacht Harbor in Oakley with an 80-percent payback. Entry: $35 single day, $50 two days. Five dollars from each registration supports the Restore the Delta Foundation. Information: (925) 757-1916. Casting lures or drifting with live mudsuckers or bluegill is productive for striped bass, too, but mainly at Big Break and favorite San Joaquin River locations, such as Mildred Island, Frank's Tract, Deep Water Channel from Light 51 to Windmill Cove, Columbia Cut and at the outfall from the power plant at Pittsburg. Bullheads, alive or dead, is the bait of choice farther down the estuary in the deeper water outside of Pittsburg Marina, and along Montezuma Slough, especially off Grizzly Island Road near Suisun City. Stripers into the 20s are claimed daily by those that put in time. The fall run is building, well in advance of the Rio Vista Bass Derby, Oct. 10-12. To prepare for the big event, the California Striped Bass Association's Isleton Chapter presents its annual seminar from 9 a.m.-4 p.m. on Sept. 28 at Ron's Place (behind Peter's Steak House) on the river in Isleton. Free admission. Information: (916) 777-6498. Trollers looking to connect with king salmon must put in time, lots of it and get lucky when pods of the coveted fish are moving through the Old Sacramento River. Pick the right day and you're a hero. More often than not, however, you're going to be the goat. Spinners such as Silvertron, Mepps, Blue Fox and Uncle Larry's seem to outproduce lures like Wiggle Wart, Kwikfish and Flatfish. Mornings are best because the afternoon breezes haven't kicked up. Salmon are caught daily from the buoys at the old mouth below Vieira's Resort up to and above the Minnow Hole in south Sacramento. On rare occasion, limits and near-limits of 18- to 27-pound kings are the rule. 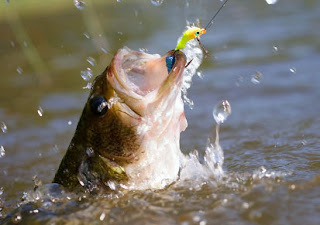 Largemouth bass will strike frogs and other top water baits early and late, but most of the bite focuses on jigs and plastics, worked slowly next to weed lines. Clear water means lighter lines and plenty of finesse. Ocean - Salmon are big, 22 to 36 pounds, but hooking them is inconsistent. For example, charters managed about one fish per rod on Friday and Saturday fishing north of the Golden Gate at Duxbury. On Sunday, however, the bite dropped nearly dead. Typical catches were made by two charters out of Sausalito that managed seven salmon to 28 pounds for 39 anglers that tried their luck between Duxbury and the Ship Channel. Better options for day trips are for 10-fish limits of mixed rock cod and lingcod as added bonuses. Until the weather on the outside turned lousy, many anglers targeted albacore tuna the past week, wracking up impressive scores at the 601 mark and Pioneer Canyon for Monterey Bay charters and 13 miles beyond the north Farallon Islands - a 41/2-hour run - for San Francisco Bay charters. Tuna are running large, mainly 22 to 32 pounds. Before the seas turned hostile, tuna were just 7 to 12 miles outside Noyo Harbor south of Fort Bragg. San Pablo Bay - Positive uptick for halibut in the usual places with live bait or dead anchovies on the troll. Why the late surge is anyone's guess but the take is impressive with flatfish to 18 pounds, averaging 10 to 12, reported Keith Fraser at Loch Lomond Live Bait in San Rafael. Striped bass are school-sized and mainly available on the incoming tide. Sturgeon fishing is zilch, but leopard shark fishing is good for the few that care. Feather - Improved flows attracted salmon to the base of Shanghai Riffle and above, but reduced water sent many of the kings back-migrating down toward Verona. Pulling flashers or anchoring with Flatfish or Kwikfish with a sardine wrapper are best techniques, according to Johnson's Tackle in Yuba City. Klamath - Salmon run has pushed beyond Somes Bar and Happy Camp, with hordes of steelhead following the spawning kings, scooping up eggs. The run is huge, perhaps, record breaking. Average king weighs 13-17 pounds, typical for the Klamath. However, poor water quality at the mouth and up to Blue Creek finds dead fish in the system because of insufficient flows and inadequate oxygen. Pray for rain or additional life saving releases from Copco Dam. On the Trinity River, salmon have pushed past Burnt Ranch and up to Douglas City, reported Tim Brady in Weaverville. Sacramento - Salmon anglers that back-bounce roe or boon-doggle find better than one salmon per rod, at times, two-fish limits, from Ord Bend and Hamilton City north to Redding. Salmon are running large with few weighing less than 20 pounds. Not many "jacks" - precocious males - this season, a poor sign for next year's spawning migration. This has been a banner year for salmon with the peak expected in early October, said Bill Quinn of Uncle Bill's Guide Service in Anderson. Alpine Lake - Fishing improves for larger-sized rainbows to 4 pounds thanks to last week's plant by the Alpine County Fish and Game Commission. Be careful launching. The ramp is almost dry and there's a big drop off if you go too far into the lake. Same is true for the launching facility at Spicer Reservoir. Best stream fishing found in the Stanislaus River North Fork on the Forest Service Road to Spicer and also at Board's Crossing, reported Ebbetts Pass Sports in Arnold. Carson River - Continuing plants by the state and county Fish and Game make for good bait drifting and lure casting, especially in the East Fork, reported Carson River Resort. Don Pedro - Good autumn bite for holdover rainbow trout to 19 inches has finally kicked into high gear. With the clarity of the water so good only single wobbling lures, towed at a brisk pace, are needed. Try at 40 feet to start the day. Air quality is much improved now that the Rim Fire is under control. Los Vaqueros - Water level has reached 130,000 acre-feet, an all-time high since the dam was elevated. Trollers and bait tossers find striped bass, 18 to 23 inches, and occasional channel catfish to 5 pounds. A Rat-L Trap tossed into Peninsula Cove fooled a 15-pound striper this week. Trout plants will resume later in the month, according to Chris Senti at the marina. New Melones - Steadily dropping to more than 135 feet below spill. Channel catfish are the prize as summer winds down. Occasional holdover rainbow found at 50 feet but kokanee are about finished, turning color and losing scales, according to Glory Hole Sports in Angels Camp. Pardee - Just 4 feet from brim full, with 17 feet clarity. Kokanee are still viable, found 90 to 120 feet on the upper end of the river. Trout respond best for bait dunkers in the backs of coves or across the dam. A channel catfish that weighed more than 7 pounds turned heads recently.